If you passed through Bruin Plaza this afternoon, you might have heard the sounds of Hare Krishna, a musical group that performs Bhajan, a type of Indian devotional song. The group, which travels around the world, is centered in Culver City. Tuesday, they played on a corner of the Third Street Promenade in Santa Monica; Wednesday, they are in Bruin Plaza. “We’re here to share music, which is one of the best ways to become happy and elevate the soul,” said performer Syaan Priya. Priya, 53, chants a special mantra and plays the harmonium, a type of keyboard instrument. Around 30 students approached the group within the first hour of their arrival. Most asked questions about the instruments and the meaning behind the chanting, Yasodeva Das said. Das, 25, plays percussion for the group. Early in the afternoon, a female student approached one of the musicians, Sudarshan Pitts, 19, and asked him about the drum he was playing, called a Mridunga. “This campus is very lively, full of friendly people,” Pitts said. Pitts first visited UCLA with the group at age 17. He said Janss Steps is one of his favorite places to play music because of the peaceful atmosphere. “But the best place to be is right here (in Bruin Plaza), talking to people,” Pitts said. Most UCLA students have grown accustomed to seeing chalkings on campus promoting various websites — but “The Lord of the Rings” references? Not so much. 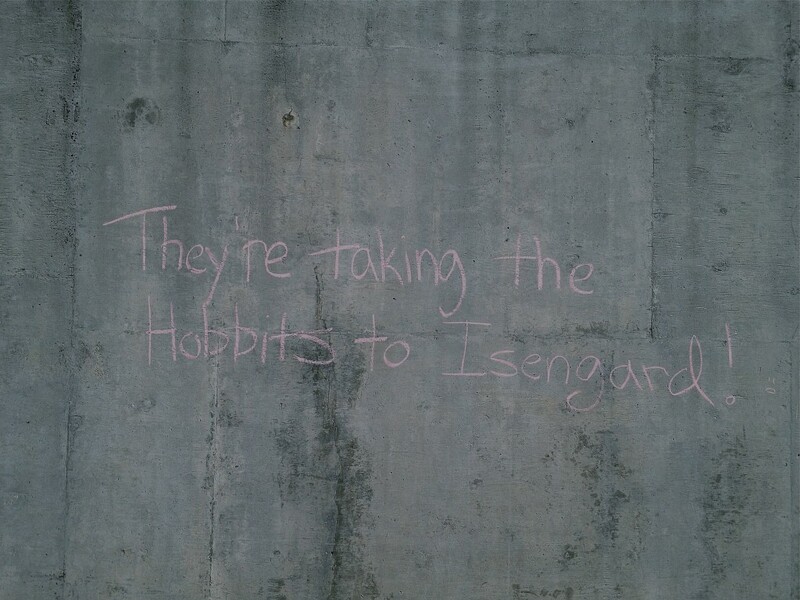 Early this morning, we noticed the quote “They’re taking the hobbits to Isengard!” scribbled in pink chalk on a wall nearby Drake Stadium. Unlike the “Diagon Alley” chalking that seems to be perpetually etched into the brick wall by one of the elevators of Parking Lot 4, this campus graffiti was removed by 2 p.m.
Have any fun snapshots of campus chalkings? Feel free to send them our way via Twitter, @dbmojo. 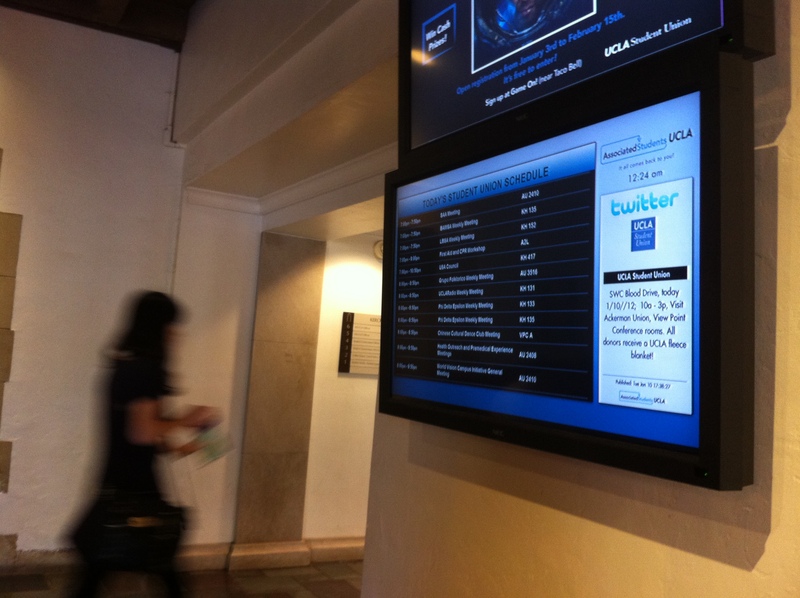 More of those 47-inch LCD screens have been popping up on walls around campus recently — part of an effort to increase digital signage. A growing number of academic departments have expressed interest in the signs, said Darren Wercinski, founder of Reach Marketing Group, the Minnesota-based company providing the screens. “A lot of departments are saying they want to quickly get a sign up to share information with students,” Wercinski said. Late Tuesday morning, Wercinski was overseeing the set-up for a screen in the corridor of Kerckhoff Hall. Alan Godwin, the company’s manager of development, conducted the assembly. Each system costs about $2,500, none of which comes from student fees, said Jackie Reynolds, director of integration and compliance with the Office of Information Technology. The screens themselves show announcements, events and a Twitter feed. Departments, either academic or administrative, can pick and choose the information to be displayed. All of the information is stored on a single server, Reynolds noted. They are also in the process of being wired to Bruin Alert, Reynolds added. “It will get you the right information in the right places,” she said.